By way of an introduction to Cecil Collins, Jane Milner-Barry has kindly given us some background to the man, and also had a chat with David Cuthbert, our speaker on Thursday evening, who is quoted below. This promises to be an unmissable event, I do hope you can come along. 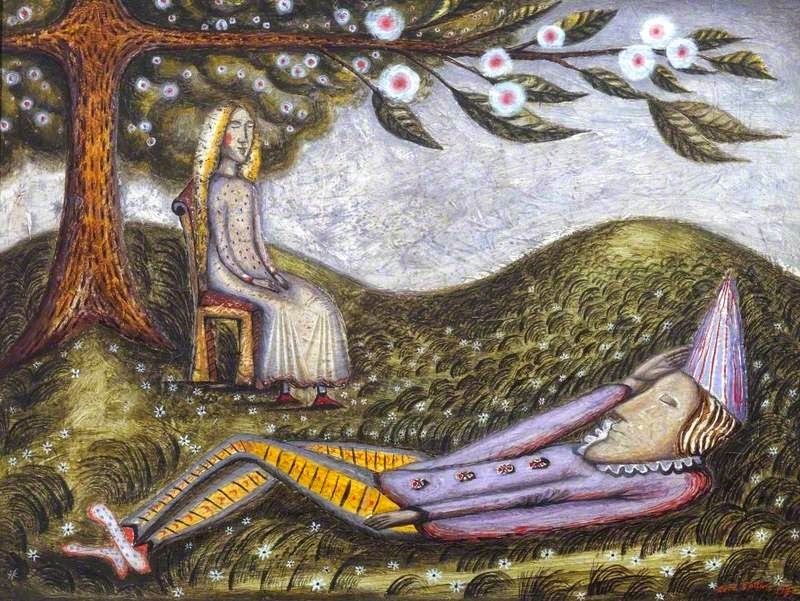 I will give you one image of a painting of his below, The Sleeping Fool, there are more appearing daily on our Facebook page at the moment, so if you click on Facebook page on the right hand side, you will see plenty more of his paintings. In the Swindon Collection, we have The Sybil and Pastoral and several drawings which I hope we can see on Thursday evening. The artist Cecil Collins felt himself to be entirely at odds with “that vast desert of machines that has been called, rather ambitiously, civilisation”. On leaving school, Cecil was apprenticed to a motor engineering firm. But he left after a couple of years to go to art school, and later won a scholarship to the Royal College of Art. He died in 1989 at the age of 81, living just long enough to visit a retrospective exhibition of his work at the Tate Gallery. Strange, mystical and obsessive, his work is well represented in the Swindon Museum and Art Gallery. As well as two large paintings, the collection includes six drawings which Cecil’s widow Elisabeth kindly donated to the Gallery after his death. An illustrated talk on Thursday 30th April will look at Collins’s relationship to the art and ideas of his time. “Cecil Collins was one of my tutors when I was a painting student at the Central School in London in 1970s. He was alternately fascinating and infuriating, informative and secretive, mystical and a doughty fighter. Inspirational, he acquired a devoted band of loyal students. I was not one of these but nevertheless found him and his work fascinating and I engaged in many discussions (and arguments) with him during my three years at the Central. What I learned from him was to be open to a wide range of influences that were not necessarily visual. He encouraged me to examine ideas and that images can resonate on many levels”. The talk will take place at the Swindon Museum and Art Gallery at 7.30 p.m. on Thursday 30th April. Tickets (£5.00, or £4.00 to Friends of the Museum) can be booked by phoning 01793 527149, or will be available on the door. I was lucky enough to be invited to the unveiling of two ceramic pieces last Tuesday, it was a lovely event, with the ceramicists in attendance, ready to talk about their work. I wasn't able to be there for the speeches, but there were handouts, so I have explanations and quotes from the makers. Text below in inverted commas is taken directly from the handouts. Both pieces are on display at the moment, in the Present Tense exhibition comes down after this Saturday, so hurry on in there. Members will receive theirs in the post soon along with Journals and membership renewal forms. Just finished envelope stuffing this evening. 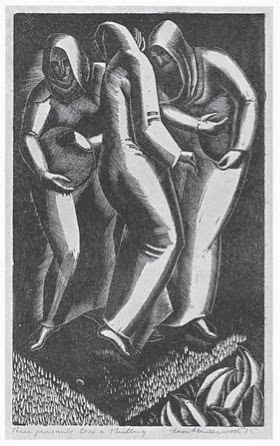 James Russell has just provided via his blog an interesting connection from Leon Underwood, featured in Mike Yates article in the recent Journal, to Eric Ravilious. 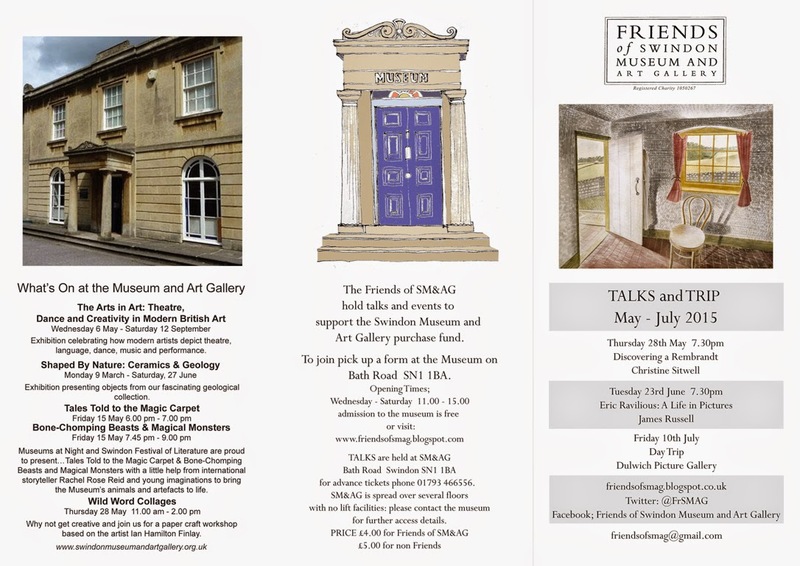 There are currently two exhibitions featuring these wonderful artists both are worth seeing. 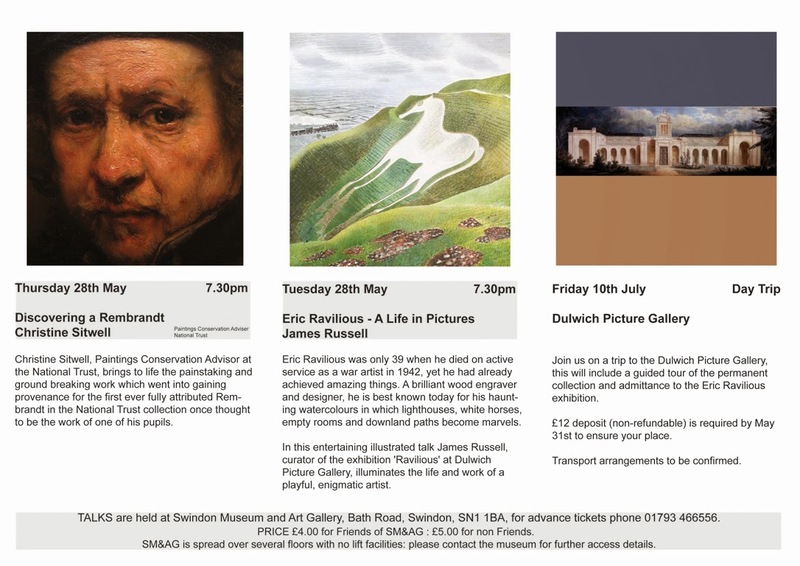 Friends are organising a trip to Dulwich Picture Gallery to see the Eric Ravilious exhibition there on Friday 10 July (further details to come). The Leon Underwood exhibition is at Pallant House in Chichester, no Friends trip here but a suuny day out looking at pictures in this wonderful gallery, then the Marc Chagall windows in the cathedral followed by a seaside walk is recommended.